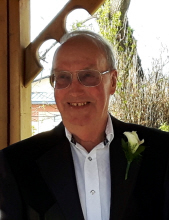 On Wednesday, April 10, 2019 Mr. John Spornitz of Edgerton, Alberta passed away at his home at the age of 76 years. John is survived by his loving family; his wife, Faye; three daughters, Leah (Darcey Dallyn) Eggen, Deb (Rick) Anderson, Terri (Chad) Moran all of Edgerton; eight grandchildren, Jens (Jen Kiesh) Eggen, Kirsta (Alex) Fong, Jade Eggen, Colin Anderson, Shaylynne (Dustin Macnab) Anderson, Kaden Anderson, Brendan Moran, Brett Moran; his niece, Shari (Greg Johnson) Spornitz of Leduc, Alberta; his brothers-in-law and sisters-in-law and their families. John was predeceased by his parents, Harvey and Jean Spornitz and two sisters, Wanda Spornitz and Joan Spornitz. In keeping with John's wishes no formal service will be held. If so desired the family suggests memorial contributions be made to the Stollery Children's Hospital Foundation or the Heart and Stroke Foundation of Alberta. "Email Address" would like to share the life celebration of John Miller Spornitz. Click on the "link" to go to share a favorite memory or leave a condolence message for the family.